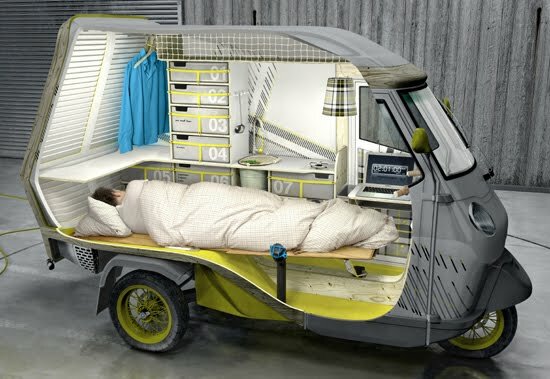 Bufalino' by german industrial designer cornelius comanns is a small camper which is equipped to meet the basic needs of one person. The concept behind the project is to offer absolute flexibility during periods of travel. The minimalist construction is based on the existing piaggio APE 50 three wheeled light transport vehicle; a model chosen for its economic and fuel efficient benefits. 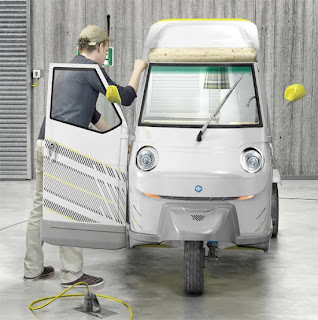 However, the more complex structural components such as the frame, the chassis, and engine are derived from the original piaggio model.